The Fireray 100R is an optical beam detector capable of covering distances of between 50 and 100 metres in length. These detectors are designed to be mounted at high level, and are particularly suited to providing detection coverage to large open areas. The Fireray 100R comes complete with a high level detector, reflector and low level control unit. The low level control unit allows the high level detector to be controlled so that the detector does not need to be accessed. 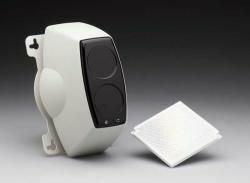 The Fireray 100R Beam Detector can be interfaced with either hardwired or wireless fire alarm systems. When the beam detector is interfaced to the fire system it can be used to activate the whole system once the Fireray Beam Detector has been activated. If you’re interested in this product, you may also be interested in our Fire Alarm Testing and Sealed Lead Acid Battery ranges.